Hettiger explained to us that the bighead carp can weigh up to 90 pounds, and each female carp can hold 90 eggs. He also told us that in order for a female carp to reproduce, she needs about 50 to 60 miles of river to lay her eggs. 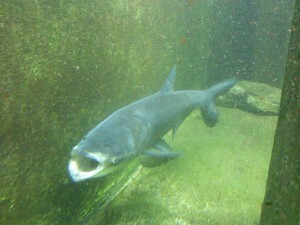 The bighead carp have been around Illinois rivers for about 10 years. They’re like bullies to the native fish, because they take the food right out of their mouths – eating all the plankton that form the base of the food chain. Hettiger said there are 5,000 to 6,000 Asian carp in Illinois lakes and rivers. When fishermen began seeing bighead carp, they mistakenly took them for catfish, according to Hettiger. The vibration of boats made the Asian carp jump out of the water up to eight feet high and hit people. Hettiger talked about the electric barrier in the Chicago Sanitary and Ship Canal which is meant to keep Asian carp out of Lake Michigan, by making them feel uncomfortable as they swim toward the lake. Near the center of the barrier is strong electric current that lets them know not to come close. 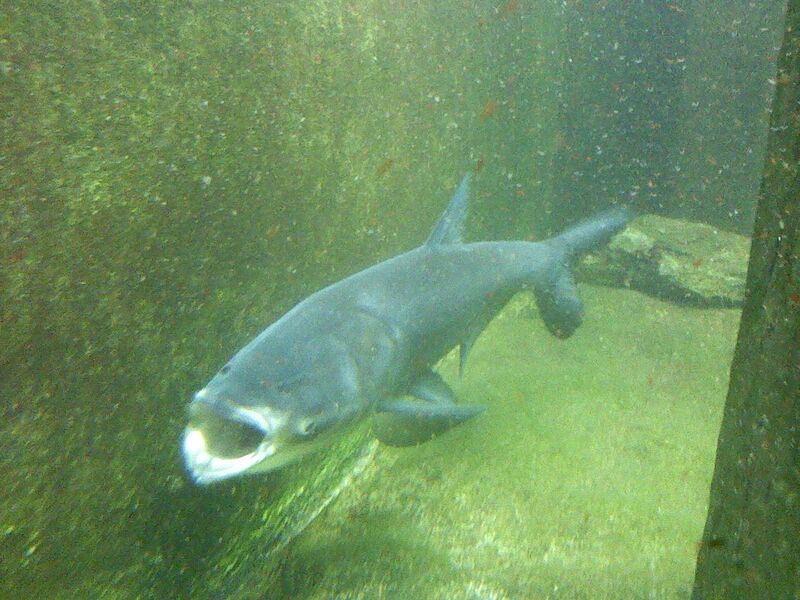 The bighead carp can eat one third of their body weight, and nothing eats them. “When the carp become so big, other things are afraid to approach them,” Hettiger said. “They’re edible but hard as a clam.” There are Asian carp in the Shedd Aquarium Great Lakes exhibit. Hettiger said they freeze the females’ eggs to destroy them. He also talked about another invasive species, the zebra mussel, that is sucking up all the microscopic food from the other organisms. He said zebra mussels and other invasive fish came in the ballast water of big ships which then dumped them in the Great Lakes, so the species were released and started reproducing. Ballast is water ships take on in other places to keep the ship steady in the water when it’s empty. Ballast water also brought round gobies, which are invasive. They stay mainly on the bottom. When we fished near Shedd Aquarium, we were catching mainly round gobies, which shows how they were getting the food meant for other fish. The round gobies have big heads, are ugly, slimy and hard to hold when you are taking the hook out. Hettiger also talked about other species at the aquarium, including dolphins and whales. The aquarium has four female dolphins named Tique, Ohana, Kri and Katrl. They also have about 40 penguins including rock hopper and Magellanic. There were about eight Beluga whales, three males and five females, which eat herring and squid. They don’t eat plankton. The largest one weighs up to 200,000 pounds. There were five successful whale births at the Shedd. “That means we’re doing good,” said Kruth. The glass in the dolphin and whale exhibit is about six inches. “Even if they wanted to get out they couldn’t,” said Braun. They also talked about the care of animals at Shedd. They talked about where they get the water and how they clean it. At the bottom of tanks they have pipes that clean the water and send it back into the system. They use clean recycled water with an ingredient called Instant Oceans. They have volunteer experienced divers who come to help clean the exhibits. If a fish at the aquarium is really sick, they will euthanize them. Altogether, they have about 92,500 animals from Europe, South America and Japan, including invasive species. Braun said her favorite animal is the sea turtle, named Nickel, whose breed lives in the Caribbean Reef. Kruth’s favorite animal at Shedd is the sea jellies in the ongoing Jellies exhibit. Hettiger said he was scared of barracudas and Great White sharks. This entry was posted	on Friday, July 29th, 2011 at 11:17 pm. You can follow any responses to this entry through the RSS 2.0 feed. You can leave a response, or trackback from your own site.